What Hobbies Are Good for Seniors? Staying active and engaging hobbies can help your senior loved one better enjoy the golden years. When seniors feel more energized and fulfilled, they’re more likely to be happier as they age. Here are some hobbies that are good for a senior’s physical health and emotional wellbeing. Knitting is a great hobby for seniors because it allows them to be creative while promoting optimal hand-eye coordination. It can also enhance concentration and may be beneficial for those with fine tremors in the hands. Seniors who use their hands for activities may also increase circulation and experience less joint pain related to arthritis. In addition to knitting, other needlecrafts such as crocheting, embroidery, and needlepoint are also good hobbies for seniors. If your loved one has poor vision, magnifying glasses may make needlework easier. Poor vision, tremors, and arthritis are a few common conditions that can make it challenging for seniors to manage daily activities on their own. If your aging loved one needs help managing everyday tasks or encouragement to adopt healthier lifestyle choices, turn to Home Care Assistance, a leading provider of home care services. Huntington Home Care Assistance provides professional in-home caregivers around the clock to help seniors live longer, happier, and healthier lives. Reading is another excellent hobby for aging adults because it can help them learn new things and enjoy their favorite genres. It also strengthens the eye muscles and keeps the mind sharp. Reading is especially beneficial for seniors with anxiety and stress, and it also promotes relaxation so they can fall asleep easily. In addition, reading and other activities that require concentration may slow the progression of dementia. Seniors who have visual deficits can still enjoy the benefits of books by listening to audiobooks. Swimming is a low-impact exercise that can build strength and stamina in seniors who are weak or have loss of muscle tone. It can also promote cardiovascular health and help older adults maintain a healthy weight. If your loved one doesn’t know how to swim, he or she can enroll in a water aerobics class to increase range of motion and flexibility. For seniors who have arthritis, swimming is one of the best exercise choices because it causes less stress on the joints and reduces the risk of injury. If you usually help your loved one exercise and need an occasional break, consider having a professional caregiver take over for you. For families living in Huntington, respite care can be a wonderful solution when their aging loved ones need companionship and socialization a few hours a week or just need minor assistance with daily household tasks. At Home Care Assistance, we thrive on helping seniors maintain their independence while living in the comfort of home. Gardening is a great hobby for people of all ages, but it’s especially beneficial for aging adults. It’s an excellent way for seniors to enjoy moderate exercise, burn calories, and enhance flexibility. Gardening also relieves stress because it increases serotonin levels. Exposure to nature enhances mood and may even reduce the risk for dementia and sleep disorders. Gardening, like knitting, needlepoint, and crocheting, enhances hand-eye coordination and promotes sensory stimulation. Although gardening is a great way for seniors to get exercise, encourage your loved one to perform a few stretching exercises prior to a gardening session. Stretching increases circulation and reduces the risk for back injuries and strained muscles. Talk to your loved one’s physician before starting a new gardening regimen or any new type of physical activity. 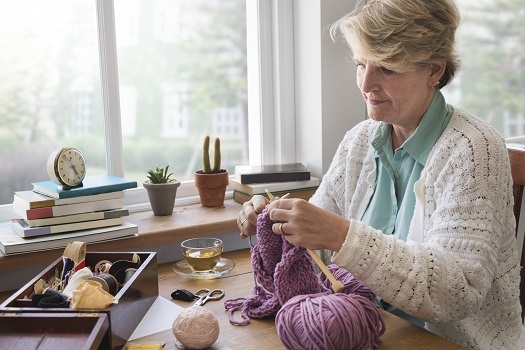 Engaging in hobbies can help seniors maintain a higher quality of life, but they may also need help managing daily tasks that help them remain healthy. In Huntington, elderly home care agencies can be a great boon to seniors. With the help of the caregivers at Home Care Assistance, your aging loved one can lead a happier and healthier life. We offer a revolutionary program called the Balanced Care Method, which encourages seniors to eat nutritious foods, exercise and socialize regularly, and focus on other lifestyle factors that increase life expectancy. For compassionate, reliable in-home care, trust the experienced professionals from Home Care Assistance. To schedule a free in-home consultation, give us a call at (304) 521-2909 today.